Yesterday marked the first day of spring!!! WoHooooo!!! Who’s ready after that doozy of a winter! Spring in Minnesota is obviously going to be a wet one. Between the massive piles of snow melting all over the place and the ground already soaked due to that crazy rain last week. It’s not surprising that spring is the season when flooding poses the greatest risk to Minneapolis houses and businesses. Spring creates the perfect storm of conditions for flooding: the ground thaws, snowmelts, and it’s always raining. The result of all this is a lot of water on the ground and in the soil. If your home isn’t prepared, that water could seep into your basement and cause all kinds of problems. Keeping your sump pump functional is probably the most important way to prevent flooding. Your sump pump should be in the lowest point of your home, so that water in the soil will flow down into the sump pump’s “pit.” Once the pit reaches a certain water level, a sensor activates the sump pump. The pump transfers the water in the pit away from your house via a discharge pipe. Find your sump pump and uncover the pit. Check the water level. If it’s higher than the sensor line inside the pit, there’s something wrong. If the water level isn’t high enough to trip the sensor, dump water into the pit until the sensor should trip. You should hear the pump activate and see the water level drop. If you’re not getting anything, there could be a problem. Long, windy winters have a tendency to knock downspouts around. If your downspouts are detached from roofing gutters, buried under snow or debris, or damaged, they won’t be able to do their job properly. Without downspouts to transfer water, your home could sustain flooding-related water damage. Find each of your downspouts and reattach them properly. Make sure the spout is clear so it will let as much water out as possible. Buff out any dents that could restrict flow. Make sure the downspouts are long enough to actually move water away from your foundation. If they are not, you’d be trading one kind of flooding for another. Roofs are slanted so that falling rainwater slides off of them rather than building up in puddles. Gutters form a perimeter around roofs to catch the rainwater as it slides off. Like roofs, gutters slant so that water flows through them into downspouts. Street gutters work that way, too, except they lead directly to storm drains. Random debris can choke gutters and drains, preventing proper flow. Water will start to accumulate at the chokepoint, which can lead to strain, flooding, or damage. Clear out your gutters and drains to make sure they’ll work. You can test gutters by simply running water through them and watching it flow. The consequences of an overburdened sewer line can really… stink. Sewer lines transfer wastewater out to either a septic tank or municipal sewer. Water in the ground can damage the sewer line or even crush its piping. A backed-up sewer line could bring gross sewer gas back up into your home. Yuck! Heavy rain can overload sewers by flooding them with too much water to handle. When that happens the water in your sewer line can’t flow out to the greater sewer system. Then the smells begin. If you suspect your sewer line isn’t doing its job you may need to have a plumber come with their fancy scopes and cameras to find the problem. If you are in need of good plumber recommendation, do not hesitate to reach out to us on our contact us now page. With the bright beautiful sun shining bright and the warmer weather already this week, the excitement of spring is definitely in the air! Soon flowers will be blooming and the grass will be green! 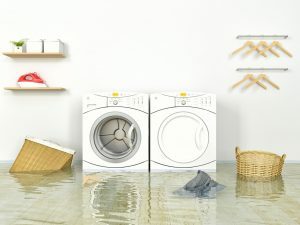 Don’t let a flooded basement get in the way of your spring joy! Get these simple little maintenance steps out of the way this weekend and you could save yourself a major headache of water damage. And don’t worry: if you do end up finding yourself with unwanted water in your home or business, 24Restore is only a phone call away. We’ll spring right into action! 24 hours a day, 7 days a week.